The eight multidirectional wheels (four sets of double spinners) are responsive, making it easy to maneuver the suitcase through airport terminals or hotel corridors without feeling any stress on my arms. Using it convinced me to never again purchase a model with only two wheels that often seem to have a mind of their own. The black, ballistic nylon material stayed almost as good as new after being tossed about on airplane cargo bays and conveyor belts. It has two very accessible zipped outside pockets for dirty laundry or stashing last-minute items or documents/papers. One thing that makes it a cut above others I’ve tried is its built-in overweight indicator, signaling when the contents go over 50 pounds. Like many other airline passengers, I live in fear of having to pay overweight baggage fees and this piece does away with the need to bring along a separate luggage scale. Another helpful innovation is that the bars supporting the telescoping handle are outside, rather than inside the case. This makes for flat, wrinkle-free packing at the bottom of the suitcase. Bottom Line: The 25” size (25 x 17 x 10.5 inches) is perfect for a two-week trip for one person. The suitcase itself weighs in at 10.8 pounds, making it reasonably light given that it has the feel of a suitcase meant to last. 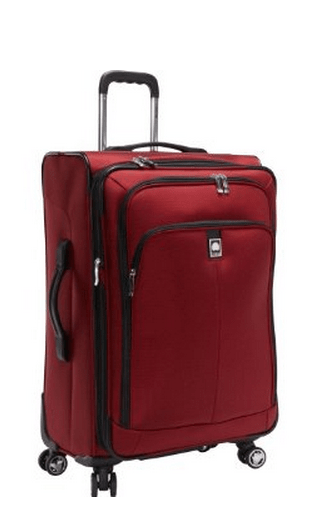 The Delsey Helium Ultimate is available in Burgundy or Black from Delsey, at Amazon and many other retail luggage and department stores. This is the bag I’ve been looking for! I have a bunch of credit card points and think I may cash them in for the “Helium Ultimate.” Thanks for the detailed review!